THERE IS NOTHING sacred or serious which the Indian politicians do not debase with their penchant for politicization and using falsehoods for amassing votes. Mahatma Gandhi was used for decades by the Congress for vote-catching without any relevance to his ideology or principles. Nathuram Godse killed Gandhi’s body but he was assassinated ideologically by the Congress again and again. Even his name is being used by its dynasty, adopting it as the family name, making thousands if uneducated innocent people believe that it is the descendents of the Father of the Nation who head the party. The party believes that the voters of the country are idiots to believe that the grandson of Feroze, pretending to be a descendent of a Vasihya (bania – which M.K. 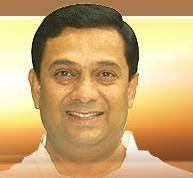 Gandhi was), “is a janaudhari Brahmin”, as proudly declared by a Congress leader. No denial was issued by the ‘secular’ party. The sacred thread or janau is worn after Upanayanam or ‘thread ceremony’ and the leader does not say when and where the ceremony was performed. And all this just to get votes as the party feared that with its appeasement of minorities it was losing Hindu votes. So he would hop around temples before elections and declare himself a Brahmin. Just as Gandhi was the leader of the freedom struggle, the struggle of the downtrodden communities oppressed for centuries as ‘untouchables’ and ‘low caste’ dalits was led by Bharat Ratna Dr. Bhimrao R. Ambedkar, son of an Jawan of the army who rose to be a Barrister who headed the committee that gave India one of the world’s best Constitutions. And so the unholy rush to claim his legacy as their own by several political parties has reached a crescendo. The so-called ‘Dalit leaders’ enjoying reservations and becoming millionaires (even as the real Dalits remain as poor and as socially ostracized as before) are so transparently fake that even Dalits who remained illiterate and poor after 70 years of freedom could see through the falsehood. A new Brahminical class of Rams and Paswans emerged, as far removed from the downtrodden as the Branhmins. 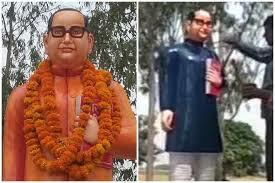 the Dalit leader, sometimes paint it saffron or breaking it. The latest farce in this field is the act of Yogi’s Uttar Pradesh government in spelling out his name in official documents as ‘Bhimrao Ramji Ambedkar’ (Dr Ambedkar, born in Mhow near Indore, MP, was a Maharashtrian and wrote his father’s name Ramji, as second name as all Maharashtrians do). 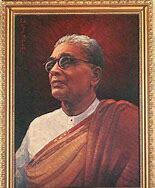 There is nothing wrong in doing so, except the motive, which was to show that his father was named after Lord Ram, though he and a lakh of his followers converted themselves to Buddhism on 14 October 1956, at Deekshabhoomi, Nagpur, over 20 years after declaring his intent to convert and a few weeks before his death. It is therefore appropriate that ‘Jai Bhim Jai Bharat’. a beautifully produced coffee table photo-book by my friend Shekhar Soni was released today (April 14) at Nagpur by Maharashtra Chief Minister Devendra Fadnavis. 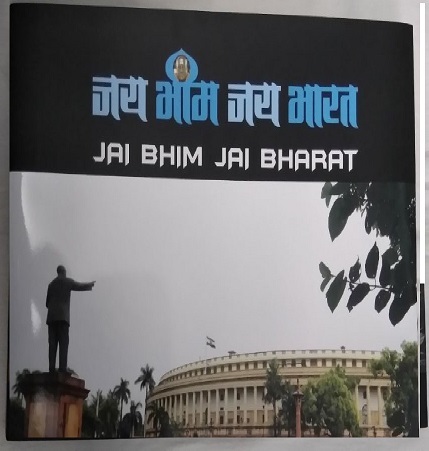 It has 125 excellent photographs depicting the journey from Mhow to Mumbai and the people, places and monuments connected with Babasaheb. Both Soni and Fadnavis are NOT Dalits. Both do not face elections now. 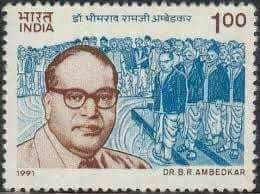 The BJP’s act including ‘Ramji’ was immediately made an issue by the Congress-led Opposition, though the Barrister signed the Constitution as ‘Bhimrao Ramji Ambedkar’ as a member of the Constituent Assembly and a postage stamp issued during Congress rule also has the same full name. Another millionaire Dalit leader made him posthumously her party’s member and erected his statues all over her state at huge cost to the tax payer. 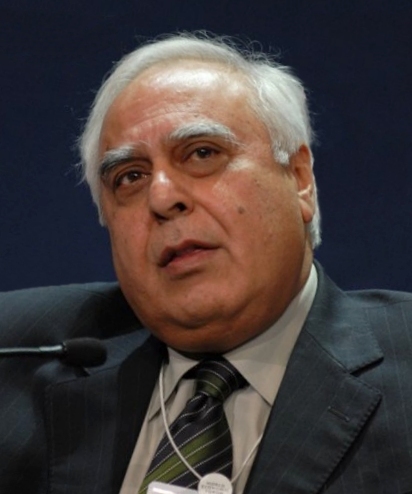 The Congress, which put up candidates against him and got him defeated twice in Lok Sabha elections, also swears by his name and the Constitution of India he helped frame, though the party amended it most. The haste with which ‘Bharat Ratna’ was conferred on members of the dynastic heads of the party was not shown in the case of Dr. Ambedkar.It was the Atal Bihari Vajpayee government of BJP which conferred it posthumously in 1990, just before his centenary in 1991. There is no doubt that the Dalits were subjected to atrocities for centuries and laws had to be made for their uplift. But a violent agitation was launched against the government for ‘diluting’ the SC/ST Atrocities Act when the Supreme Court – not the BJP-led NDA government — ruled that arrests under the Act should be based on verification that such atrocity was committed and not be done automatically. The agitation, declared as a ‘big success’ by BSP leader Mayawati as it resulted in destruction of property worth 1000 crores and death of 10 people (including an RSS man to oppose caste violence), was launched despite the government declaring that it was opposing the ruling, had no intention to dilute the Act and did not propose to abolish reservations. Perhaps the Congress-led Opposition front was sought to be wrought on the funeral pyres of those killed and the flames burning public property. 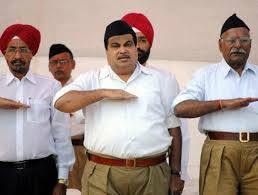 Union Minister Nitin Gadkari (centre), with RSS chief Mohan Bhagwat to his left. JUST WHEN YOU ARE RESIGNED TO THE FACT THAT ALMOST NO ONE reads your blog posts, someone surprises you with a comment. 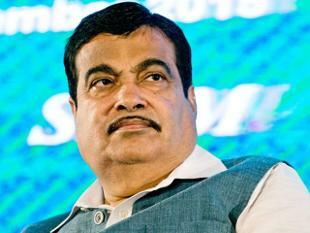 Jokes about his ‘ample weight’ apart, would he be Vidarbha’s first CM? Five days ago I wrote about the bonanza of development Nagpur, “the heart of India” as the country’s central point, is about to get due, not to the long overdue industrialisation but to the enforcement of GST from July 1. Not one Nagpurian seems to have read it, as none reacted, though links to the blog were sent to many. Suddenly I learnt it was the 100th. I felt ‘UnstoppaleAfterSeventy’ was ‘stoppable’ after 100. So I stopped writing. 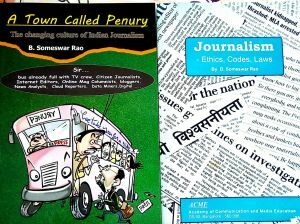 Continue reading Nagpur Now, Vidarbha Next? Posted on May 24, 2017 May 24, 2017 Categories politics, Random PostsTags Bloomberg, Bonanza, Capital, Cargo Hub, Cow, Leaders, Modi, Nagpur, Progress, RSS, Salve, State, Vidarbha2 Comments on Nagpur Now, Vidarbha Next?